The Aeronca K series, Aeronca Chief, Aeronca Super Chief, Aeronca Tandem, Aeronca Scout, Aeronca Sea Scout, Aeronca Champion and Aeronca Defender were a family of American high-winged light touring aircraft, designed and built from the late 1930s. Aeronca was noted for producing light side-by-side two-seat touring aircraft since the introduction of the Aeronca C-2 in 1929. A more refined aircraft with an improved undercarriage and steel tube wing bracing struts in place of wires, was developed in 1937 as the Aeronca K, powered by a 42 hp (31 kW) Aeronca E-113 engine, beginning the long line of Aeronca high wing touring, training, military liaison and observation aircraft of the 1930s and 1940s. The K series was powered by a variety of 40 hp (30 kW) to 50 hp (37 kW) Aeronca, Continental, Franklin or Menasco engines. Consumer demand for more comfort, longer range and better instrumentation resulted in development of the Aeronca 50 Chief in 1938. Although little more than an incremental development of the K series the Model 50 heralded a new designation system used for the high-winged tourers, including the manufacturer and power rating of the engine, dropping the letter designation system. Thus the Aeronca 65CA Super Chief' was powered by a 65 hp (48 kW) Continental A-65 with side-by-side seating and improvements over the 65C Super Chief. Other developments included tandem seating for use as trainer, liaison, observation aircraft or glider trainers as well as float-plane versions. Throughout the production life of the Aeronca Chief family the aircraft was improved incrementally, from a rather basic specification to a reasonably comfortable tourer with car-style interior. The Aeronca high-wing formula used a welded steel tube fuselage covered with fabric, wooden wings covered with plywood and fabric braced by V-struts to the rear undercarriage attachment point on the lower fuselage. Tail surfaces were also built up with welded steel tubing covered with fabric. The fixed tail-wheel undercarriage, sprung with oleo struts and faired triangular side members hinged at the fuselage. A small tail-wheel on a spring steel leaf at the extreme rear of the fuselage completed the under-carriage. The engine is fitted conventionally in the nose and was either semi-cowled or fully cowled using sheet aluminium alloy, depending on model. Some civilian models had side-by-side seating in a well-glazed cabin under the wing centre-section, with entry through car style doors either side. A tandem seating arrangement was developed for training and military models with the rear seat mounted 9 in (229 mm) inches higher than the front to allow the instructor to use the same instruments as the trainee and improve forward view from the back seat. Tandem seat aircraft had extensively glazed cockpits to allow good all-round visibility. A wide variety of engines were available for use on the Aeronca Chief series, including home grown Aeronca engines and Continental, Franklin, Menasco or Lycoming engines. The engine installed was reflected in the designation using the initial letter as a suffix in the designation. 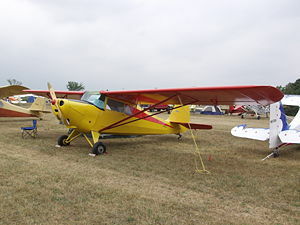 Aeronca continued development during World War II, introducing the tandem seating Aeronca 7 Champion, taking advantage of the refinements developed with previous versions. The Champion is often regarded as a completely new design, but the influence of the Chief and Tandem is readily apparent. A side-by-side version was also introduced in 1945 as the Aeronca 11 Chief. Military versions of the Aeronca 7 series were operated by the USAF as the Aeronca L-16. Civilian aircraft proved popular as touring aircraft and as trainers. Military aircraft found employment as trainer, liaison, observation aircraft primarily with the USAAF. (1936) Precursor to the KC Scout, powered by a 40 hp (30 kW) Franklin 4AC. 6 built. (1937) detail improvements including doors either side. Powered by a 40 hp (30 kW) Continental A-40. 34 built. (1938) Introduced a wider cabin for improved comfort, evolved into the wide-cabin 50C Chief. Powered by a 50 hp (37 kW) Continental A-50. 62 built. (1938) a Franklin engined version of the Model K. Evolved into the 50F Chief. Powered by a 50 hp (37 kW) Franklin 4AC. 5 built. (1938) a Menasco engined version of the Model K. Evolved into the 50M Chief. Powered by a 50 hp (37 kW) Menasco M-50. 9 built. (1937) Production float-plane versions of the Model K. 13 built. (1938) An improved KCA with a wider cabin, powered by a 50 hp (37 kW) Continental A-50. 248 built. The first light-plane to fly non-stop from Los Angeles to New York City, on 29–30 November 1938, covering 2,785 mi (4,482 km)miles in 30hours 47minutes, averaging 90 mph (145 km/h), with an impressive fuel cost-per-mile of about one cent. (1938) powered by a 50 hp (37 kW) Franklin 4AC. 40 built. (1938) The 50L had exposed cylinders and was powered by a 50 hp (37 kW) Lycoming O-145. 65 built. The 50LA, with Lycoming engine, had a closed cowling. 20 built. (1938) A single 50M was built, powered by a 50 hp (37 kW) Menasco M-50. (1939) The first tandem Aeronca, introduced as competition for the Piper Cub, powered by a 50 hp (37 kW) Continental A-50. 16 built. The 50TL was powered by a 50 hp (37 kW) Lycoming O-145. 33 built. (1940) Essentially the same as the50TC, powered by a 60 hp (45 kW) Franklin 4AC conferring slightly increased performance. Powered by a 60 hp (45 kW) Lycoming O-145. 118 built for the USAAF as the O-58B, powered by a 65 hp (48 kW) Continental A-65. (1938) Powered by a 65 hp (48 kW) Continental A-65. 279 were built, many of which were impressed by the USAAF as O-58/L-3s in 1942. The 65C with an optional 8 US gal (30 l) auxiliary fuel tank, and other deluxe appointments. 655 built. (1939) Powered by a 65 hp (48 kW) Lycoming O-145. 87 built. (1940) Powered by a 60 hp (45 kW) Lycoming O-145. 199 built. (1940) Powered by a 65 hp (48 kW) Continental A-65. 112 built. Tandem seating for military training, 154 built. 1940) Powered by a 65 hp (48 kW) Franklin 4AC, 59 built. (1940) Powered by a 65 hp (48 kW) Lycoming O-145. 299 built plus 4 YO-58, 20 O-58, 701 L-3B, and 499 L-3C, plus 253 TG-5 gliders to the USAAF. (1944) The Tandem/Defender re-vitalised for the postwar market, powered by a 65 hp (48 kW) Continental A-65-8, 7,200 were built and ircraft for the USAAF were designated L-16. Revived in 1954 as the Champion Citabria, which later became the Bellanca Citabria. (1947) Powered by a 85 hp (63 kW) Continental C-85-8 and fitted with improved undercarriage, reinforced fuselage, and other refinements. 509 were built, all of which were delivered to the USAAF as Aeronca L-16As. (1948) Powered by a 85 hp (63 kW) Continental C-85-8, fitted with a dorsal fin and larger tail-plane. 168 built. The 7DC fitted with a wood-lined cargo bin. The 7DCS (akaS7DC) was the float-plane version with a ventral fin. (1949) Powered by a 90 hp (67 kW) Continental C-90-12F, the first Aeronca offering a starter and a generator. 96 built. Resurrected as the Champion 7EC in 1955. The 7ECS (akaS7EC) was the float-plane version of the 7EC with a ventral fin and floats. (1949) A single prototype of a 7EC fitted with a Tricycle undercarriage. (1945) Powered by a 65 hp (48 kW) Continental A-65, post-war production of the chief with more refined interior and other improvements. 1,862 built. Shares no parts with the previous pre-war Chief, but 70% of parts are shared with the 7 series Champion. Used as the basis for the Hindustan Aeronautics HAL-26 Pushpak trainer in 1958. (aka S11AC), the floatplane version of the 11AC Chief. (1945) Powered by a 85 hp (63 kW) Continental C-85-8F. 180 built. (1948) Powered by a 85 hp (63 kW) Continental C-85-8F, the 11CC introduced a higher gross weight, and wider centre of gravity range. 276 built. (akaS11CC), the floatplane version of the 11CC Super Chief. (1941) The military version of the Model 65T Tandem with greenhouse cabin and 65 hp (48 kW) YO-170 / O-170-3, similar to civil models. Originally designated in the Observation category, changed to the Liaison category in 1942. (YO-58 / O-58) 54 built. With no radio and reduced weight. 490 built. Eleven 65TF, with Franklin 4AC-167 engines, impressed into the USAAF. Twelve 65TC, with Continental A-65-8 engines, impressed into the USAAF. Nineteen Super Chiefs, with Continental A-65-8 engines, impressed into the USAAF. Four Super Chiefs, with Lycoming O-145-B1 engines, impressed into the USAAF. One 65TL, with Lycoming O-145-B1 engine, impressed into the USAAF. One 65TC, with Continental A-65-7 engine, impressed into the USAAF. A trainer for glider pilots produced by removing the engine, fairing in the nose and fitting a tow hook for aero-towing. 253 built. A single TG-5 converted for prone-pilot tests. All 509 Aeronca 7BCM aircraft were delivered to the USAAF as the L-16A. The original prototype 50-C (s/n C-1018) is on display at the New England Air Museum, Bradley International Airport, Windsor Locks, CT. There is an Aeronca 65TC on display at the Pacific Aviation Museum in Hawaii that was in the air at the time of the Pearl Harbor attack. ^ a b c d e f g h Abel, Alan (2001). Aeronca's Golden Age. Wind Canyon Books. ISBN 1-891118-42-0. ^ a b c Eckland, K.O. "Aeronca". USA: Aerofiles.com. Retrieved 26 March 2012. ^ "New England Air Museum". neam.org. Retrieved 1 January 2017. ^ "Aeronca Model TC-65 (Observation) – Pacific Aviation Museum Pearl Harbor". pacificaviationmuseum.org. Retrieved 1 January 2017. ^ Aviation February 1940, pp. 37, 69–70. Eckland, K.O. "Aeronca". USA: Aerofiles.com. Retrieved 26 March 2012. Abel, Alan (2001). Aeronca's Golden Age. Wind Canyon Books. ISBN 1-891118-42-0. "American Planes and Engines for 1940". Aviation. Vol. 39 no. 2. February 1940. pp. 37, 69–70. (Registration required (help)). Aircraft specification no. A-796. Revision 14. (Aug. 1, 1991.) Department of Transportation. Federal Aviation Administration. "American airplanes: Aeronca". Aerofiles: A Century of American Aviation. Retrieved 2006-08-12. "Bellanca". Aerofiles: A Century of American Aviation. Archived from the original on 20 July 2006. Retrieved 2006-08-12. Bhargava, Kapil. "The IAF as an aircraft manufacturer". Indian Air Force – History. Archived from the original on 2006-08-26. Retrieved 2006-09-05. "HAL Pushpak". Warbirds of India. Retrieved 2006-09-05. Hollenbaugh, Bob; John Houser (1993). Aeronca: A photo history. Destin, FL: Aviation Heritage Books. ISBN 0-943691-10-9. Juptner, Joseph P (1994). "ATC #761 (9-28-45): Aeronca 'Chief,' 11AC (11BC)". U. S. Civil Aircraft Series. 8 (ATC 701-800). Blue Ridge Summit, PA: Tab Aero—McGraw-Hill. pp. 211–213. Juptner, Joseph P (1994). "ATC #796 (9-28-45): Aeronca 'Super Chief,' 11CC". U. S. Civil Aircraft Series. 8 (ATC 701-800). Blue Ridge Summit, PA: Tab Aero—McGraw-Hill. pp. 332–334. Type certificate data sheet no. A-761. Revision 17. (Aug. 1, 1991.) Department of Transportation. Federal Aviation Administration. Aircraft specification no. A-759. Revision 69. (April 2, 2007.) Department of Transportation. Federal Aviation Administration. Guillemette, Roger. "Aeronca L-3". US Centennial of Flight Commission. Archived from the original on 4 January 2006. Retrieved 2006-01-04. Swanborough, F.G.; Peter M. Bowers (1963). United States Military Aircraft since 1909. London: Putnam. "Aeronca L-3 Aircraft Finder". AeroWeb: The Aviation Enthusiast Corner. City University of New York. Archived from the original on 2006-01-18. Retrieved 2006-01-04. Simpson, Rod. Airlife's World Aircraft: The Complete Reference to Civil, Military and Light Aircraft. Shrewsbury, UK: Airlife Publishing, 2001. ISBN 1-84037-115-3. Wikimedia Commons has media related to Aeronca Chief models 50 and 60. This page was last edited on 15 January 2019, at 07:40 (UTC).